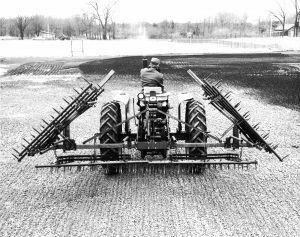 One, two, three and four-sections are available to fit most standard harrow sections that are 5’, 5’6” and 6’ wide. 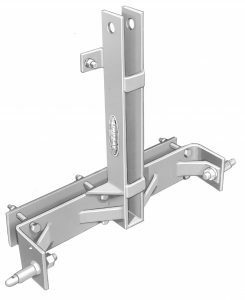 One and two-section drawbars are one piece tubular steel with a standard three point hitch. Three-section folding drawbar folds to one section wide. Four-section, three point hitch drawbar folds to 2 sections wide. One section on each side folds up for easier transporting. Two parking stands are furnished with each wing model. Lift Arms – High arch design for maximum section clearance. – Extra heavy pipe for durability. On a four-section unit, a chain is hooked from the front of the tractor and runs back to the wing booms for extra strength. NOTE: Strong and rugged standard 3-point hitch for Cat. I or Cat. II hitch.